Cristo Rey St. Martin College Prep (a GFF grantee) alumni Ofelia Gonzalez recently graduated from Bradley University and started teaching 3rd grade in Zion. 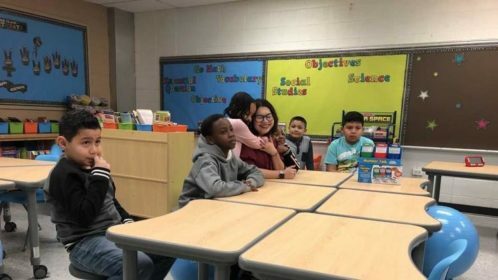 The Chicago Tribune shared an article, “Zion teacher wins $15,000 classroom makeover with ‘creative, collaborative’ furniture” about a grant she was awarded for a new flex-space classroom furniture set-up from Lakeshore Learning Materials. Gonzalez was selected, from thousands of entrants across the country, because of her passion for teaching and her understanding of the need for a creative and collaborative classroom.